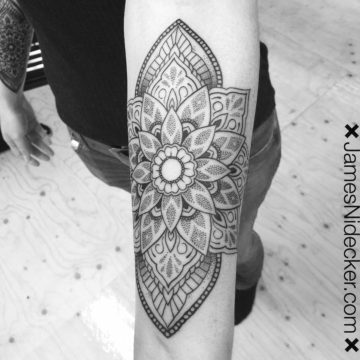 As an Amsterdam tattoo artist I specialize in mandalas, dotwork and geometric tattoos combined with semi realistic black & grey images. I have lived, worked and tattooed in Bangkok and New York and currently live and tattoo in my home town of Amsterdam (The Netherlands). I have my own tattoo studio in Amsterdam called New Amsterdam Tattoo Studio which has an official Dutch GGD tattoo license and is located at Aalsmeerweg 8 in Amsterdam. My working days in Amsterdam are from Monday till Friday but sometimes vary per month so email me first to check my availability. My current waiting list is approximately about 3-4 months. I try to stay within a certain style of tattooing and mainly focus on a combination of dotwork, mandalas, geometrical designs and black & grey. Also I’m currently only working on medium and larger projects (no small tattoos). This means I will NOT do every kind of geometrical tattoo request anymore. To see my recent work please check out the tattoos I have done in the portfolio section or on Instagram to see more about my style of tattooing. Due to the high volume of requests I might not be able to accept every request but I’ll always do my best to reply to every email. Being an Amsterdam tattoo artist means we have a lot of clients coming in from outside of Holland and I always try to accommodate everyone the best I can. But be adviced that it is always better to book your tattoo appointment early and not wait till the last week to check my availability. All films you find on this site are shot, directed and edited by me and my girl Kiki on location in New York, Bangkok and The Netherlands. Also check the Frequently Asked Questions (FAQ) page where you can find more info about how I work, click here to read it all.